Maurice Tani has performed many times at SFFFF over the years. His sets are always engaging performances featuring his smart blend of alternately dark, humorous and romantic, story-driven songwriting, and his haunting, intimate vocal style. The roots are in country, rock and folk, but his taste is very broad, straying into jazz and blues influences and the Great American Songbook, so expect a variety of unexpected spices and clever twists throughout. Some find his between-song “notes” as interesting as the songs themselves. Known for his wry/rye-to-romantic songwriting, agile guitar style and expressive singing, Little Village recording artist Maurice Tani uses the term “Supercalifornographic”, to describe his particular flavor of Americana. 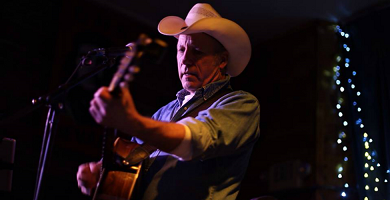 While rooted (at times distantly) in country music, his writing is centered on an urban-western perspective. Short musical narratives of life on the left coast. A sort of cinema for the blind.